After spending a lot of time with the Husqvarna Viking Opal 690Q, it was hard to choose just ten reasons why I love this sewing machine. Can you guess which one is my Number One? The ability to program and save my own stitch combinations or settings is awesome. Let’s say that my favorite width of satin stitch isn’t one of the built-in ones – then I can create my own with my personal preference for width and length. If I want to make a signature tag for all my projects – there’s no need to make hundreds at once. The stitch will be in ‘My Favorites’ menu, ready for me to stitch up the tags when I need them. The possibilities with this feature are endless. I love the fact that I can change the way the functions work. So nice to know that I can put on the single hole throat plate or use a single hole presser foot and if I change the stitch, the sewing machine will remind me that I will have to make some changes. I can have the FIX, Thread Cutter and Sensor foot on automatic or I can use them manually should I choose. There are times when you absolutely want these features turned on and others when it is best if the functions are done manually. Nice that we have the choice. The TouchScreen is amazing. I love being able to see my stitches before I stitch them out. The TouchScreen is clear and responsive. 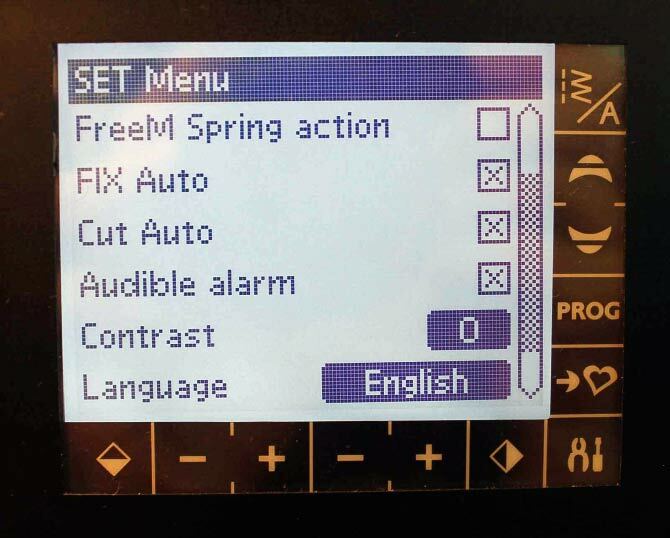 I like the fact that while there are many stitches, options and settings in the machine, they’re all nicely tucked into their appropriate menus. This allows me to focus on only the function that I want. I’m not overwhelmed by a lot of choices at any given time. The stylus is easy to use and in a very handy location. The Opal 690Q is an easy machine to learn. And if you are anxious to get quilting or sewing, you can take it out of the box, plug it in and start to sew. Check that stitch width though! I would recommend spending some time with the manual so that you can appreciate ALL the features that this machine has. But none of them are complicated. That is a HUGE amount of stitches. While you would think that many stitches would be overwhelming, they are nicely organized into FOUR menu groups according to their purpose. The fact that each stitch can be adjusted by changing the length and the width means you have a LOT more than 200 stitches. The possibilities are endless and I would strongly suggest that you pick a couple and play with them. The stitches are shown in the four menu groups on the inside of the pop up lid. While I greatly appreciate all the functions in the Function Panel, I love the STOP function. When you’re sewing decorative stitches and want to completely conclude that stitch or you want to just stitch out ONE unit of a stitch, the STOP function takes all the guess work out of the job. The sewing machine then ties off the thread. That is a hard one to beat! What can I say – the curve of the Extension Table is gorgeous. The fact that your arms just sit on that table without the least hint of strain or stress makes me think that the Husqvarna design team spent a lot of time thinking about this element. For someone who spends a lot of time at the sewing machine, this small detail is HUGE. 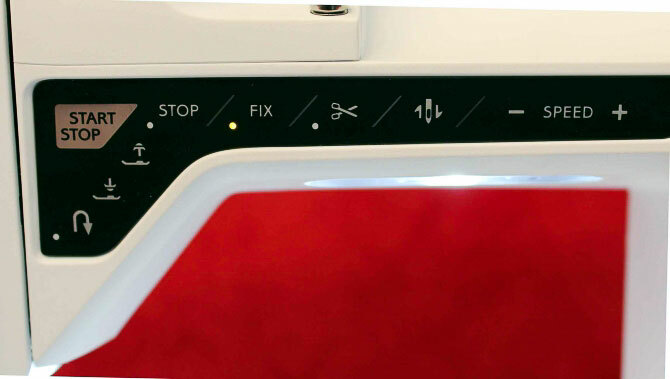 The curve will also eliminate any drag when you are sewing big pieces together – like the backing of a quilt and when it comes to quilting a quilt? This is just a brilliant design. See how nice you hands sit on this table. Yes – it really is as comfortable as it looks. 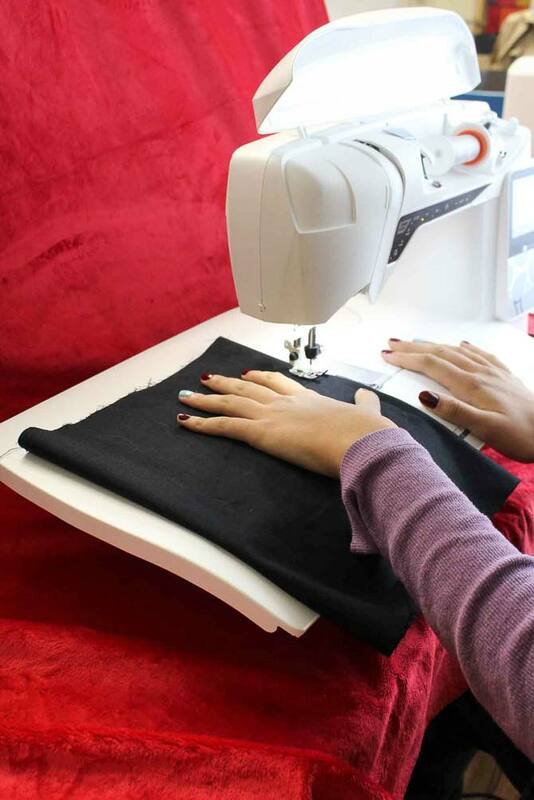 Imagine having someone setting up your sewing machine every time you start something new? Yes – it doesn’t get better than that. You simply input the type of fabric you’re using and the style of stitching you’re undertaking and the Husqvarna Viking Opal 690Q takes care of the stitch length, the presser foot pressure, the tension and a whole lot more. Yes – you can override any or all of those settings if you choose. 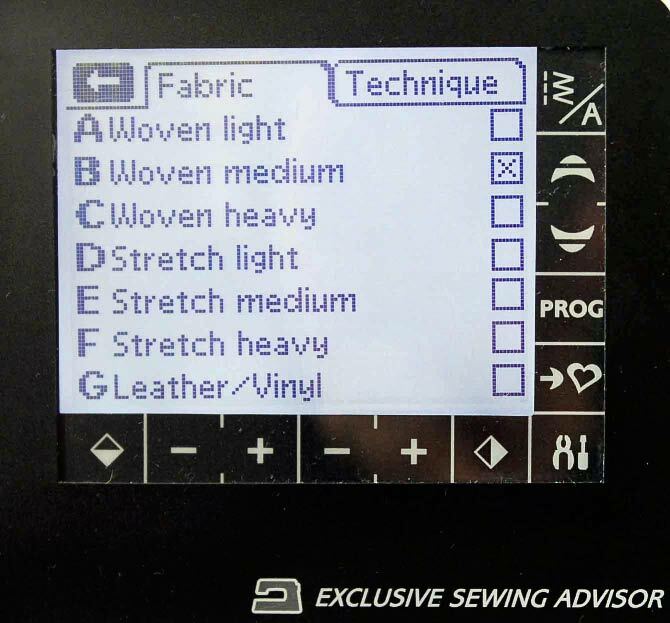 Highlight the type of fabric and the weight that you are about to sew. Choose the type of stitching that you are going to do. This is another function on the Functions Panel that I just love. 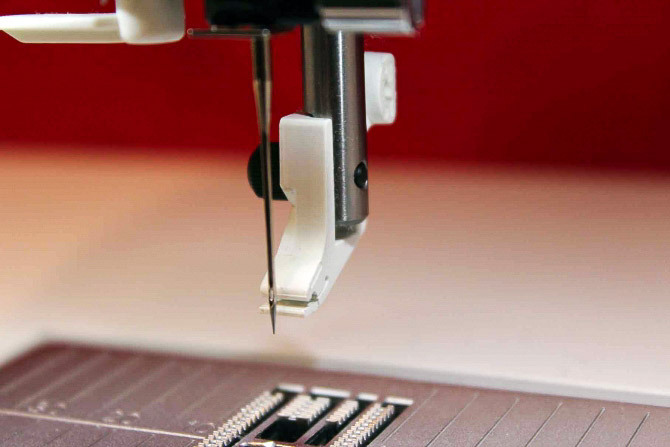 When this function is engaged, the sewing machine will stop sewing. The needle will stop in the fabric. 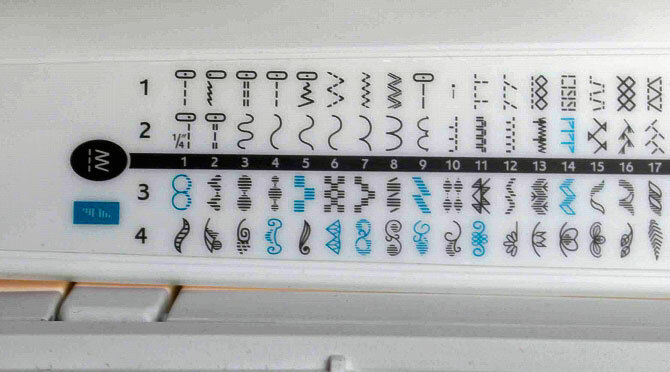 This is an absolute when you’re doing applique or quilting. If you need to take a break, the needle will hold the fabric in place until you can continue. In conjunction with the Sensor Foot, this combination is brilliant. …And the Number One reason why I love the Husqvarna Viking Opal 690Q – did you guess? Yes I love the SENSOR FOOT so much that I would NEVER consider purchasing my main sewing machine without this feature. The Sensor Foot provides hands (and knee or foot) free control of the presser foot. 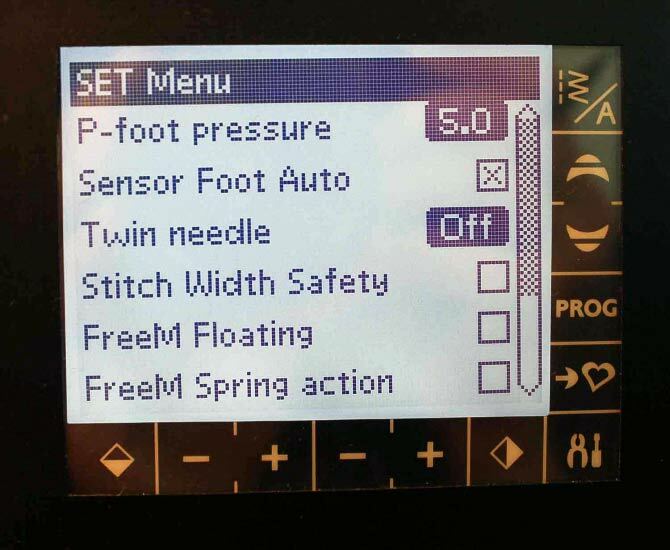 This feature has FOUR positions for the presser foot and each of them is easily reached by using tapping the foot pedal, using the controls on the Functions Panel OR setting them for automatic pivot while you sew! 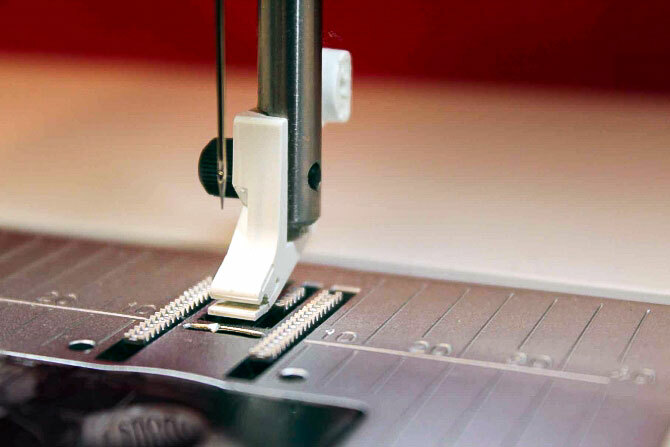 Not only is this feature a MUST for applique, but when you’re piecing, the sewing machine will stop and the press foot will raise up slightly – just enough for you to tuck the next piece under the presser foot without having to lift the presser foot and without having your fabric shift. This feature is a definite deal breaker for me. 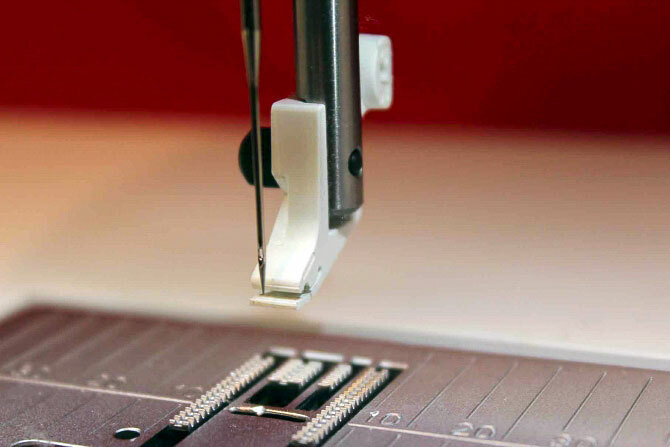 To buy a sewing machine without the Sensor Foot is like buying a car without a steering wheel. 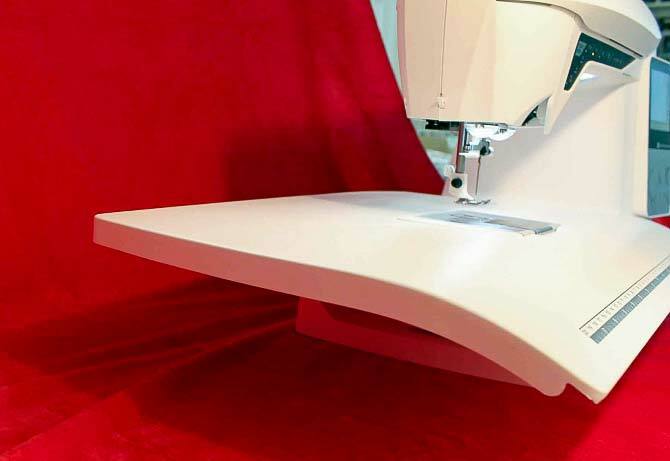 If you weren’t convinced that the Husqvarna Viking Opal 690Q is an awesome sewing machine before… you should be by now. I hope you’ve enjoyed counting down the top ten reasons why I love the Husqvarna Viking Opal 690Q. I can’t think of anything that’s missing. 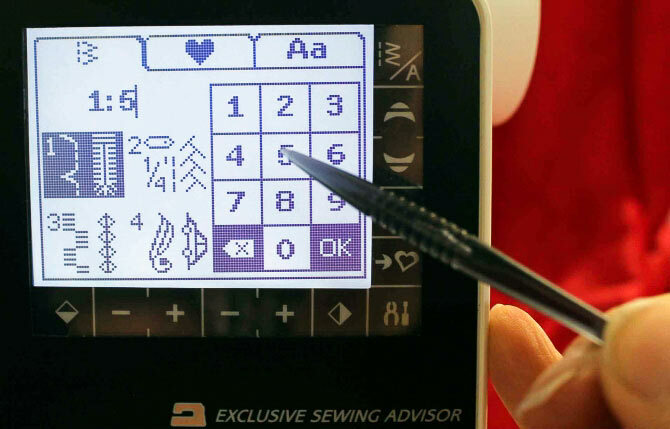 The Opal 690Q will meet the needs of the new and experienced sewist. It provides room to grow and the endless possibilities – you’ll never tire of finding something to sew. Creative Embroidery Helps Market Tote Shine! 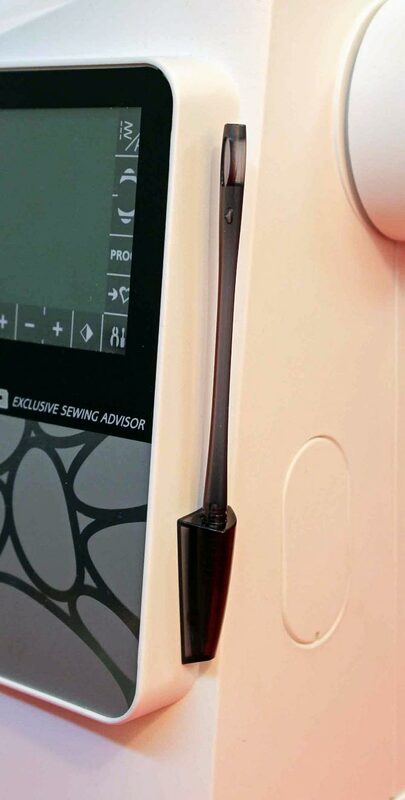 Can you please tell me if the Opal 690Q comes with the extension table, or did you purchase it separately? Good question. The Opal is a lighter (weight) machine if you will be transporting it a lot. Many people who chose between the two that chose the Sapphire were glad they did as they appreciated the space even for piecing. I would also get the feature list of both from Husqvarna web site and go through it line by line to compare. I think it boils down to weight, throat size and money. Spologies if this is a duplicate post. Do you know the approximate weight of the HV690Q? I’d like to know if it is light enough to take to classes. I have a HV MegaQuilter, but it is SO heavy and only does straight stitches. The 690Q is currently on sale for half price, and I’m thinking of buying it. I can’t find any information on the weight of the machine in the online user’s manual, and I would like to know if is light enough to take to classes. Any information you can provide would be appreciated. Thank your so much for writing this review! I have just ordered this machine myself and have a question I hope you could answer. Does this machine require a walking foot for feeding multiple layers of fabric? Or is it capable of doing this well due to the sensor foot? Thanks so much for the great feedback. You are going to love your new sewing machine. If you are going to be quilting (3 layers), I would recommend that you buy the walking foot as well. It will help to keep the quilt top and back from shifting out of place during the quilting process. Enjoy your new machine and send us some pictures of your creations. 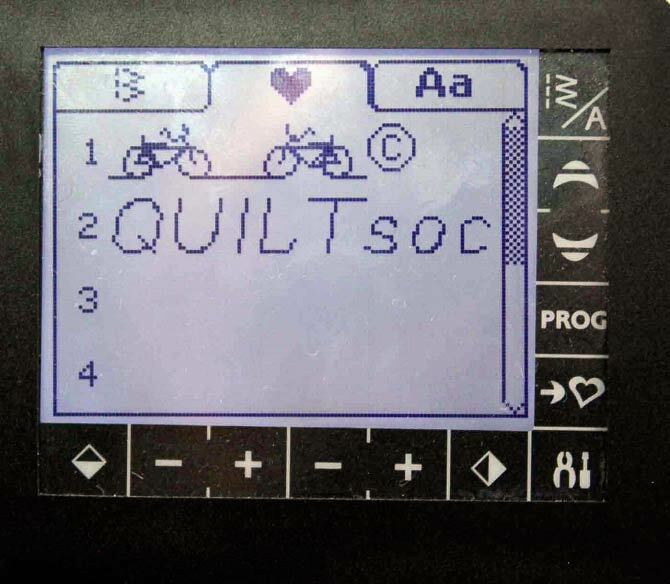 Thanks for following QUILTSocial. Great posts about the 690. I want one now! Do you know if the the 690 could use feet from a Juki machine? I’m thinking of making a switch, but I have so many feet for the HZL300. Thanks! Woo good question. I know what you mean about having all those sewing feet and accessories, it’s hard to part with and you would want to reuse these. Personally, it never hurts to explore and try it. 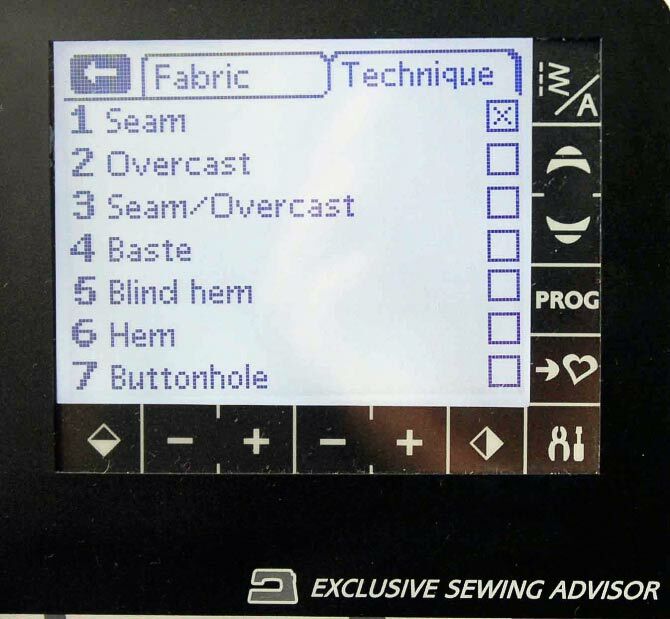 Otherwise, ask your dealer when test driving the sewing machine. I read this review and purchased the machine with the extension table ( I agree a must) I came from another brand of machine and there is truly no comparison. Love how the foot just sets itself down and takes off. Also being able to adjust the needle to a true 1/4 from how I personally sew and saving that to memory. I am looking forward to hours of sewing. Thank you for your review. I wasn’t even really interested in a new sewing machine until reading this review and learning about all the things a sewing machine can do. Thank you so much. I have ordered this very machine and am looking forward to receiving it. I have just one question, where did you find the extension table. I looked on the Husqvarna website, but I don’t see it listed as one of the accessories. Thank you again for the awesome review. I’m so excited for you. You are going to love the Opal 960Q. Make sure you explore all the functions and let your creativity go wild. As for the extension table, here is the link to the table. http://www.husqvarnaviking.com/en-CA/Accessories/Extension-Table-with-Adjustable-Guide-en. If that link doesn’t work, search Husqvarna Viking Extension Table, it should pop up. 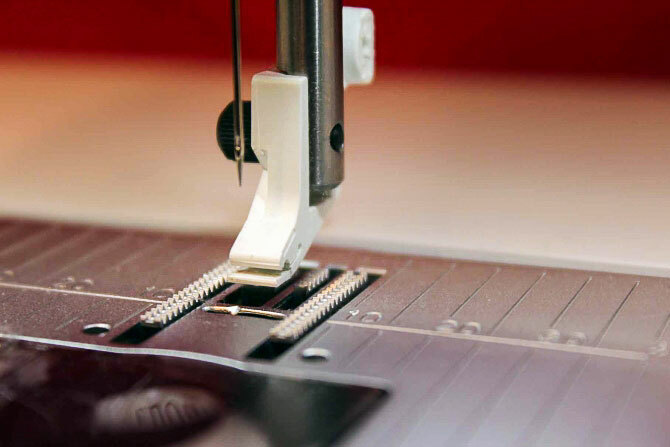 The extension table works for many of the Husqvarna Viking sewing machines so don’t be alarmed when you see the table (on the link) is hooked up to a different sewing machine. Enjoy your new sewing machine. Send us a photo of some of your projects. Thank you for the reviews, I am now very eager to buy this machine for myself.